Film-coated tablets: Box of 20. Each tablet contains : Lysine clonixinate : 125 mg, Cyclobenzaprine HCl: 5 mg.
Exipients: corn starch; microcrystalline cellulose; magnesium stearate; hydroxypropyl methylcellulose; patent blue V aluminium lake; titanium dioxide; triacetine. 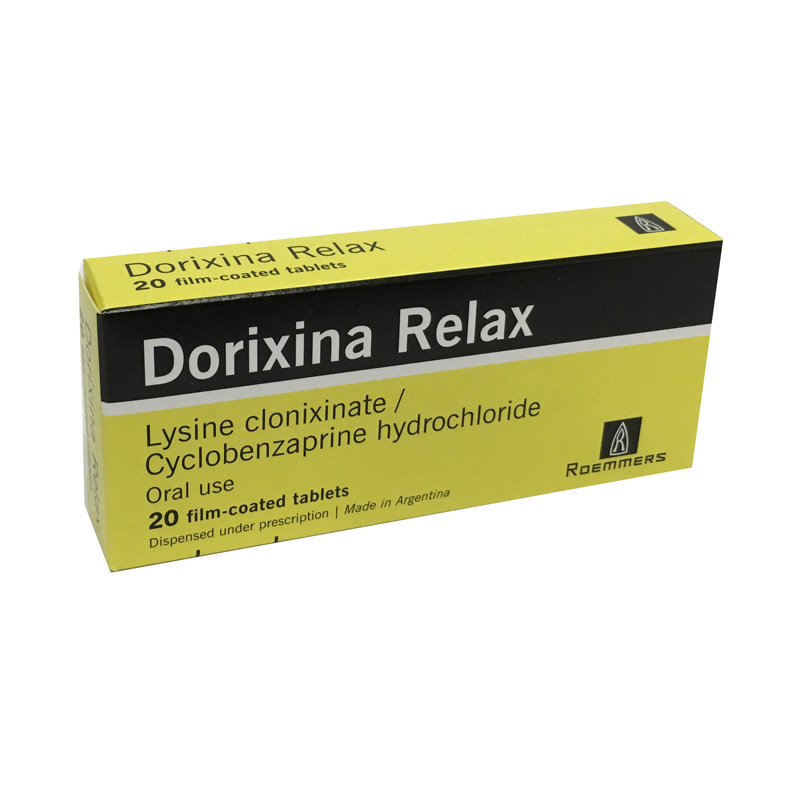 Dorixina Relax due to its lysine cloxinate component is a NSAI drug, with mainly analgesic action. It exerts its effect by inhibiting prostaglandin synthesis. It was recently shown that it acts principally on the enzyme that catalyzes the production of prostaglandins responsible for inflammation (cyclooxygenase-2 or COX-2) with less activity on the kidneys (cyclooxygenase-1 or COX-1), where these substances exert a protecting role. The cyclobenzaprine component relieves skeletal muscle spasm of local origin without interfering with muscle function. Cyclobenzaprine relieves muscle spasm and reduces tonic somatic motor activity, influencing both gamma and alpha motor systems at central nervous level. Lysine clonixinate is rapidly absorbed reaching its peak plasma level about 40-60 minutes following administration. Its bioavailability is of about 56%, with some individual variability. The plasma half-life of lysine cloxinate in humans is of about 1.75±0.10 hrs (mean ± SD). It is excreted in the form of metabolites, principally in the urine (60%). Its concentration in milk is of about 7-10% of the plasma concentration. Cyclobenzaprine is easily absorbed and circulates highly bound to plasma proteins. It is primarily metabolized in the liver and excreted predominantly via kidney. It is eliminated quite slowly with an effective half-life oscillating between 1 and 3 days. Dorixina Relax is indicated for the treatement of musculoskeletal pain, specially when associated with muscle spasms. Known hypersensitivity to Lysine clonixinate or Cyclobenzaprine. Active peptic ulcer or gastroduodenal hemorrhage. Pregnancy. Children and adolescents under 15 years of age. In patients with a history of bronchospasms, nasal polyps, angioedema or urticaria caused by the administration of acetylsalicylic acid (aspirin) or other NSAIDs. Due to the Cyclobenzaprine component it is contraindicated during coadministration of monoamine oxidase inhibitors (IMAO) or within 2 weeks after their discontinuation. Recent acute myocardial infarction, heart failure, arrhythmia, heart block or conduction disturbances. Hyperthyroidism. In cases of allergic skin and/or mucosal reactions or symptoms of peptic ulcer or gastrointestinal hemorrhage, discontinue treatment with Dorixina Relax. The Cyclobenzaprine component may enhance the depressant effects of alcohol, barbiturates or other CNS depressants. Caution should be used when administering to patients with a history of digestive diseases like gastroduodenal peptic ulcer or gastritis and in patients treated with anticoagulants. Although no case with the administration of Lysine Clonixinate has been reported, it is known that NSAIDs inhibit the synthesis of prostaglandins which have a supportive role in the maintenance of renal perfusion. In patients with impaired renal blood-flow administration of NSAIDs may precipitate overt renal decompensation, usually reversible with the discontinuation of the product. Patients at greatest risk of this reaction are dehydrated patients, patients with congestive heart failure, hepatic cirrhosis, nephrotic syndrome or other overt renal diseases, patients taking diuretics or those who underwent major surgeries with subsequent hipovolemia. In these patients diuresis volume and renal function have to be controlled before initiating therapy. Although also not observed during treatment with Lysine clonixinate, administration of NSAIDs may increase transaminase plasma levels or other liver parameters. In most cases these elevations over normal limits are small and transient. Cyclobenzaprine, chemically related to tricyclic antidepressant and parasympatholytic drugs should be used with caution in patients with a history of urinary retention, angle-closure glaucoma, increased IOP and in patients taking anticholinergic medication. Pediatric use: There are no clinical studies available with Cyclobenzaprine administered to children and adolescents under 15 years of age, therefore its use is contraindicated in patients of this age group. Geriatric use: Like with other anti-inflammatories, administer with caution to elderly patients, as they may have impairment of their cardiac, hepatic or renal functions. Other NSAIDs (including high doses of acetylsalicylic acid): Increase of the risk of gastroduodenal ulcer and hemorrhages due to their synergistic action. Oral anticoagulants, ticlopidine, heparin (systemic administration), thrombolytics: Major risk of hemorrhages. If concomitant administration is unavoidable, strict controls of blood coagulation must be performed adjusting the dosage of those medicines which modify coagulation parameters accordingly. Lithium: Usually NSAIDs increase lithium plasma levels. Closely monitor lithium plasma levels when starting, modifying or discontinuing treatment with Dorixina Relax. Methotrexate: Concomitant treatment with methotrexate and NSAIDs may increase hematological toxicity of methotrexate. In these cases, strict hematological controls must be performed. Diuretics: In patients with dehydration, treatment with NSAIDs increases the potential risk of acute renal failure. In cases of concomitant treatment with Lysine clonixinate and diuretics patients must be properly hydrated and their renal function controlled before initiating treatment. Antihypertensives (ex. beta-adrenergic receptor blocking agents, ACE-inhibitors, vasodilators, diuretics): During concomitant treatment with antihypertensive agents and NSAIDs a decrease in antihypertensive effect has been reported due to the inhibition of vasodilating prostaglandins. Due to the Cyclobenzaprine component interaction with MAO inhibitors may trigger hyperpyretic crisis, convulsions, with fatal outcome. When coadministered with guanethidine and similarly acting compounds, it may theoretically block their antihypertensive action. Cyclobenzaprine may impair mental and/or physical abilities required for performance of hazardous tasks, such as operating machinery or driving a motor vehicle. Pregnancy: Although preclinical toxicological studies did not show teratogenic effects with the use of Lysine Clonixinate and Cyclobenzaprine, there is no sufficient experience available with the administration of these drugs to pregnant women. Therefore Dorixina Relax should not be administered during pregnancy. Lactation: Studies carried out in humans showed that excretion of Lysine Clonixinate in human milk is low. It is not known whether Cyclobenzaprine is excreted in human milk. Nevertheless and since Cyclobenzaprine is closely related to tricyclic antidepressant, some of which are known to be excreted in human milk, the risk/benefit ratio should be evaluated before administering Cyclobenzaprine to nursing mothers. At therapeutic doses Dorixina Relax is well tolerated. In rare cases, specially when administered to sensitive patients, nausea, vomiting, gastritis and somnolence may occur. The association with Cyclobenzaprine may cause somnolence, dry mouth and dizziness. Less frequently (1-3%): Asthenia, nausea, constipation, dyspepsia, unpleasant taste, blurred vision, headache, nervousness. With an incidence of < 1% the following adverse events were reported: Malaise; tachycardia, arrhythmia, hypotension, palpitation; anorexia, vomiting, diarrhea, abdominal pain, gastritis, thirst, flatulence, abnormal liver function. On very rare occasions: Hepatitis and cholestasis; anaphylaxis, angioedema, pruritus, facial edema or edema of the tongue, urticaria, rash; ataxia, vertigo, dysarthria, tremor, hypertonia, muscle spasms, convulsions, disorientation, insomnia, depressed mood, anxiety, agitation, abnormal thinking and dreaming, excitement, paresthesia, diplopia; sweating; ageusia, tinnitus and urinary frequency or retention. Administer 1 tablet 3 times/day at regular Intervals, according to pain intensity. Swallow the tablets whole, without chewing them and with abundant liquid. Its continuous administration for over more than 2-3 weeks is not recommended. Maximum daily dosage: 6 tablets. No cases of overdosage with Dorixina Relax were informed. The Cyclobenzaprine component may produce transient confusion, transient visual hallucinations, excitement, muscle rigidity, vomiting, hyperpyrexia, hypothermia, tachycardia, heart block or congestive heart failure. In addition to the already mentioned adverse events, also mydriasis, convulsions, severe hypotension, stupor and coma may occur. After a thorough evaluation of the patient, considering the time lapsed from administration, the amount of drug taken and having discarded the contraindication of certain procedures, the physician will decide upon carrying out the general rescue treatment: Gastric evacuation (vomiting or gastric lavage), activated charcoal administration, strict clinical control (specially gastroduodenal, renal and cardiovascular function) and symptomatic supportive care. Physostigmine salicylate administered intravenously in doses up to 1-3 mg can revert the symptoms caused by overdosage of atropine or other anticholinergic drugs; therefore it might theoretically be useful in the case of Cyclobenzaprine overdosage. Due to its rapid metabolism it is recommended to evaluate case by case the necessity of repeating the dose. The routine administration of physostigmine is not recommended due to its toxicity. Arrhythmias may be treated with neostigmine, pyridostigmine or propranolol; in some cases, the use of short acting digitalis drugs might be necessary. Close cardiac monitoring should be continued at least for 5 days. Keep in a dry place at temperature below 30°C.